The trial of Adolf Hitler for high treason after the Beer Hall Putsch was not the end of Hitler's political career as many had expected. In many ways marked the true beginning. Overnight, Hitler became a nationally and internationally known figure due to massive press coverage. The judges in this sensational trial were chosen by a Nazi sympathizer in the Bavarian government. They allowed Hitler to use the courtroom as a propaganda platform from which he could speak at any length on his own behalf, interrupt others at any time and even cross examine witnesses. Rather than deny the charges, Hitler admitted wanting to overthrow the government and outlined his reasons, portraying himself as a German patriot and the democratic government itself, its founders and leaders, as the real criminals. "I alone bear the responsibility. But I am not a criminal because of that. If today I stand here as a revolutionary, it is as a revolutionary against the revolution. There is no such thing as high treason against the traitors of 1918." 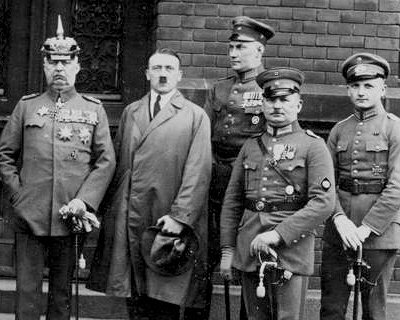 Hitler considered the traitors of 1918 to be the German politicians responsible for the so called 'stab in the back,' who prematurely ended World War I and established the German democratic republic. In Hitler's mind and among many Germans, their Army had not been defeated on the battlefield but had been undermined by political treachery at home. In reality, German Army leaders themselves had opened negotiations with the Allies to end the war which they were losing. But newspapers quoted Hitler at length. Thus, for the first time, the German people as a whole had a chance to get acquainted with this man and his thinking. And many liked what they heard. The defiant defendant, Adolf Hitler, with fellow defendants in the Putsch trial, including Gen. Ludendorff (left) and Ernst Röhm (right front) who will soon loom large in the Nazi movement. 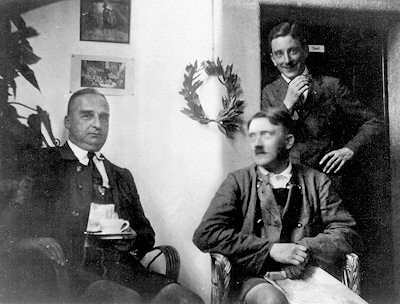 Below: The prisoner Adolf Hitler looking comfortable in Landsberg with fellow Nazis, Hermann Kriebel (left) and Emil Maurice (rear). "The man who is born to be a dictator is not compelled. He wills it. He is not driven forward, but drives himself. There is nothing immodest about this. Is it immodest for a worker to drive himself toward heavy labor? Is it presumptuous of a man with the high forehead of a thinker to ponder through the nights till he gives the world an invention? The man who feels called upon to govern a people has no right to say, 'If you want me or summon me, I will cooperate.' No! It is his duty to step forward. The army which we have now formed is growing day to day. I nourish the proud hope that one day the hour will come when these rough companies will grow to battalions, the battalions to regiments, the regiments to divisions, that the old cockade will be taken from the mud, that the old flags will wave again, that that there will be a reconciliation at the last great divine judgment which we are prepared to face. For it is not you, gentlemen, who pass judgment on us. That judgment is spoken by the eternal court of history...Pronounce us guilty a thousand times over: the goddess of the eternal court of history will smile and tear to pieces the State Prosecutor's submissions and the court's verdict; for she acquits us." The court's verdict – guilty. Possible sentence – life. Hitler's sentence – five years, eligible for parole in six months. The three judges in the trial had become so sympathetic that the presiding judge had to persuade them to find him guilty at all. They agreed to find Hitler guilty only after being assured he would get early parole. Other Nazi leaders arrested after the failed Putsch got light sentences as well. General Ludendorff was even acquitted. On April 1st, 1924, Hitler was taken to the old fortress at Landsberg and given a spacious private cell with a fine view. He got gifts, was allowed to receive visitors whenever he liked and had his own private secretary, Rudolf Hess. The Nazi Party after the Putsch became fragmented and disorganized, but Hitler had gained national influence by taking advantage of the press to make his ideas known. Now, although behind bars, Hitler was not about to stop communicating. Pacing back and forth in his cell, he continued expressing his ideas, while Hess took down every word. The result would be the first volume of a book, Mein Kampf, outlining Hitler's political and racial ideas in brutally intricate detail, serving both as a blueprint for future actions and as a warning to the world. NEXT SECTION - Hitler's Book "Mein Kampf"